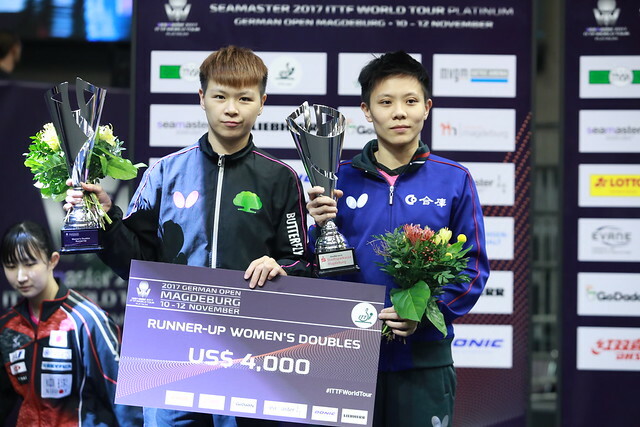 Upsets on the opening day of play, Tuesday 7th November, in the Men’s Singles qualification tournament for the Seamaster 2017 ITTF World Tour Platinum German Open in Magdeburg; there was no great shortage. However, pride of place for upsetting higher rated adversaries went Brazil’s Vitor Ishiy, Frenchman Joe Seyfried and China’s Zhou Kai; all three beat players who have enjoyed notable ITTF World Tour success. Listed at no.236 on the current Men’s World Rankings, Vitor Ishiy accounted Ukraine’s Yaroslav Zhmedenko, named at no.153 (11-8, 5-11, 11-7, 11-9, 12-10), Joe Seyfried, who stands at no.236, overcame Russia’s Vasiliy Lakeev, ranked no.150 (11-4, 11-6, 11-5, 11-9); Zhou Kai beat the host nation’s Patrick Baum (10-12, 12-10, 11-7, 7-11, 11-8, 11-8). Currently Zhou Kai has no world status, Patrick Baum is at 87. Impressively in 2009, Yaroslav Zhmudenko won the Under 21 Men’s Singles title at the ITTF World Tour Grand Finals in Macao; in 2014 Vasily Lakeev claimed Men’s Singles gold in both Egypt and Belarus. Meanwhile Patrick Baum was the runner up in Japan in 2009 and in the Czech Republic in 2014; furthermore, he reached the Men’s Singles final at the European Championships in 2010 in Ostrava and the following year in Gdansk. On both occasions he was beaten by colleague, Timo Boll. Noteworthy efforts, it was the same from the Czech Republic’s Tomas Polansky, Hungary’s Adam Szudi and Bulgaria’s Philipp Floritz alongside Chinese Taipei’s Sun Chia-Hung, Japan’s Kojo Kanamitsu and Hungary’s Bence Csaba. All beat higher ranked adversaries on a day when the leading names in the opening phase of proceedings were not called to action. Tomas Polansky beat India’s Sanil Shetty (9-11, 11-7, 11-9, 11-8, 13-11), Adam Szudi accounted for Romania’s Cristian Pletea (7-11, 21-19, 9-21, 11-8, 11-8, 11-8); Philipp Floritz overcame the host nation’s Kilian Ort (12-10, 11-8, 11-2, 11-7. Likewise, Chinese Taipei’s Sun Chia-Hung overcame Italy’s Niagol Stoyanov (6-11, 7-11, 14-12, 11-6, 11-7, 4-11, 11-4), Koyo Kanamitsu defeated Frenchman Alexandre Cassin (11-6, 11-4, 11-7, 12-10); Bence Majoros accounted for the Czech Republic’s Michal Obeslo (11-8, 11-4, 11-2, 11-4). Additionally, the host nation’s Qiu Dang beat Mexico’s Marcos Madrid (6-11, 11-5, 7-11, 12-10, 11-5, 11-6), Nador Ecseki accounted for Ukraine’s Viktor Yefimov (11-8, 11-5, 11-8, 9-11, 11-9); Poland’s Patryk Zatowka defeated Japan’s Asuka Sakai (12-14, 11-6, 11-5, 11-9, 6-11, 11-9). Surprises, each to their own view but there was one technical knock-out that was in reality no surprise at all. China’s Yu Ziyang, who had beaten the host nation’s Jun Mizutani in the Men’s Singles final at the GAC Group 2014 ITTF World Tour Japan Open but in recent times has been absent from the international scene and thus has no world ranking, beat Croatia’s Tomisav Pucar but only just, he needed the full seven games (11-7, 10-12, 10-12, 11-7, 5-11, 11-5, 11-6). Players finishing in first places in group no.19 to group no.46 advance to preliminary round one; the winners then gain places in preliminary round two where the join the players who ended the day in first positions in group no.1 to group no.18.